Ruth Rogers and Rose Gray have an unswervingly clear vision of how food should be cooked: they take immense care over the ingredients and cook them as simply as possible. But one vitally important element in the art of preparing good food is one which we have increasingly lost sight of: seasonality. If you cook food in its right season it will inevitably taste better. 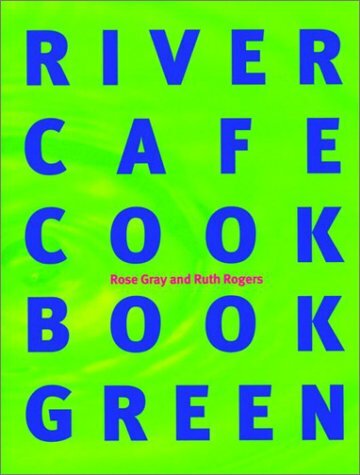 And that’s what River Cafe Cookbook Green is all about. Divided into months, the twelve chapters look at which vegetables, herbs, leaves, fungi and fruits are at their best at any given time, with information on how they are grown, which varieties to select and how to prepare them. The focus is also on organic produce, something in which Ruth and Rose have come to believe passionately. Meat and fish are certainly included in the book, but the emphasis here is much more on vegetables, pasta etc, in line with the way we are increasingly eating today. Fully illustrated throughout, and even larger than before, the book is an education as well as a culinary treasure-trove.